Olga and Raul Reyes didn’t make it with their La Palapa Veracruzana. But the second time's a charm. Raul Reyes opened his first restaurant in 2008, a tiny place in Oak Cliff serving the colorful cuisine of his birthplace, the Veracruz region of Mexico. La Palapa Veracruzana was run by his family, wife Olga working as his co-chef, daughter Jaretzy taking managerial duties, and son Raul Jr. waiting tables. The seafood-centric menu snagged the palates of serious food lovers and critics in Dallas, but the kudos posted on food blogs and the glowing reviews couldn’t keep it alive. It closed after only a year. Dejected, Reyes figured he would have to shed his chef whites forever and return to the construction business to support his family. Before La Palapa Veracruzana closed, Reyes had augmented his income by taking on handyman jobs. Chris Zielke, co-owner of Bolsa and Smoke, had hired Reyes to rebuild the bar at Bolsa, the popular farm-to-table restaurant in the Bishop Arts District. So Reyes showed up at Bolsa one day and told Zielke he’d closed his restaurant. Zielke encouraged Reyes to try again. He offered to help the family with marketing. Word that Zielke was lending a hand to Reyes hit the restaurant community, and other volunteers turned up to offer their assistance. Nick Zukin, co-owner of Kenny & Zuke’s Delicatessen in Portland, Oregon, flew down and traded his knowledge of food costing and plating in exchange for cooking lessons. (Zukin is opening a Mexican restaurant in Portland.) Former Bolsa bartender Eddie “Lucky” Campbell helped revise a cocktail menu. The team came up with a new name for the old space, Mesa Veracruz Coastal Cuisine, and devised a marketing plan and a service training program. Well, this gringa would gladly eat any dish on Mesa’s menu, even if it was served on the sidewalk—though I much prefer the cozy 50-seat dining room on West Jefferson. Mesa is only 1 mile from the trendy eateries in the Bishop Arts District, but the atmosphere of the neighborhood transports you to another world. Instead of chic t-shirt shops, boutiques, and trendy bars, the lively strip of West Jefferson between Beckley and Zang is lined with quinceañera and bridal dress stores, pawn shops, and tattoo parlors. At night, the street scene is festive. Families stroll and chat with neighbors, street vendors sell Mexican paletas, and teenagers hang on the sidewalk, blasting Latin music from boom boxes. The interior is as stunning as the food. Colorful cactus blooms poke from shallow holes carved into a brick wall. A row of old wooden pallets has been sanded, stained, and backlit with rope lights. They hang on the main wall lined with banquettes. 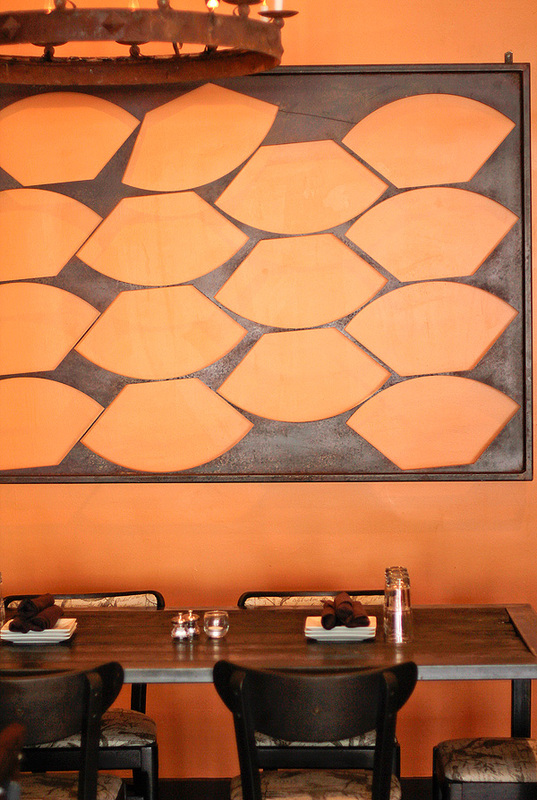 The community table was built with wood Reyes salvaged from the fence that once surrounded the restaurant’s dumpster. The railing at the entrance and the wall hangings were created from scraps of metal rescued from trash bins at Wooten Metal. Several customers have tried to buy the large mirror Reyes framed with acid-washed tin. The dining room is so personal that you can’t help but feel like you are eating in someone’s home. In reality, you are. Raul and Olga are back in the kitchen, and Raul Jr. and Jaretzy are once again in the front of the house. The whole Reyes “show” has been polished and shined. Trained servers, bartenders, and staffers allow Raul and Jaretzy to excel in personalized service. Every time I visited, the tempo of the meals was upbeat and smooth.